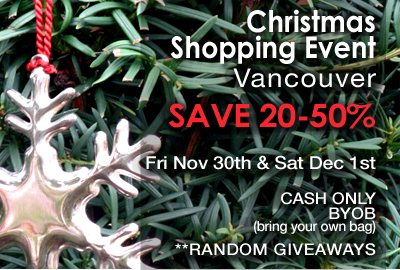 Shop in person for all kinds of unique gifts and everyday eco finds at 20-50% off at our Vancouver Christmas Shopping Event Friday, November 30th and Saturday, December 1st. Join us for two days of deals and some great giveaways at Prêt-à-Porter located on Vancouver's North Shore at 1445 Bellevue Avenue in West Vancouver – just minutes from the Lions Gate Bridge. We'll be there with a selection of our best selling green gifts and goods from 10am to 5pm on Friday and 10am to 2pm on Saturday. This is a cash-only, BYOB event – that's bag, not bottle! Preview our Lavish & Lime eco collection and let us know if there's anything in particular you'd like us to bring either by posting a comment below or via email at customerservice(at)lavishandlime(dot)com. Hope to see you there! Am hoping for Kids Konserve stainless steel containers (the nesting round ones). Also, the floral stainless steel cups and Scotch nail polish. Thank you! We'll be sure to bring those along!